This posting is a little bit different for me. First off, I’ve made a batch of graphs. That I’ve done so at all is a bit “new” for me. But beyond that, I’ve made the graphs before even starting the article. It was the data that got me looking, but the graphs that made the case. And what is that case? That it’s a bad idea to play with the instrumentation. First, the motivation. In looking at the GISS anomaly maps, Turkey is always roasting. There was something about that that just seemed wrong. It ought to have been a more random event; who was Hot Hot Hot and who was not. You will probably want to click on the graphs to get a bigger version to look at. Notice that the dT line is the “cumulative” dT/yr. Notice also that right around 1990 the dT/yr goes very small in range. The volatility just leaves it. So we see that dT is running along at a lower value, and dT/yr is dead flat for a couple of years, THEN about 1994 dT/yr pops up and dT starts a run for the moon. So what happened between 1990 and 1994? Looking at the temperature data directly, there were a lot of overlapping adds and drops. Duplicate Number flag 0 or 1 that carried forward and overlapped with Duplicate Number flag 2 or even flag 3. So their is a bit of ‘feathering’ or ‘blending’ of the dropping, adding, and changing. I believe that is why when you look at the dT/yr right about 1989 – 1993 it goes to very small volatility, even though a large number of thermometers leave the record (or perhaps, because of it). Eventually we are left with a lot of new Duplicate Number flag thermometers and very few of the older consistent record. Now look again at the dT/yr line. Notice anything? Run your eye along the peaks at about the 1.3 C level just above the 1 C line. Notice the consistent peaks? Now run your eye along the -1 C line. Notice the consistent peaks starting before 1970? Now run your eye along at about -0.5 C. Notice how much more area is in the down spikes before 1990 when compared with after? Something started to slightly clip the lower excursions in the ’80s, but that 1990 change substantially eliminates them and strongly dampens or blunts any more than about -0.75 C and reduces the number significantly. Don’t know what it was, but it happens at the same time the Duplicate Number flags change. And We’ve seen this in Canada (as the Smith Effect at Fort Smith) and I’ve seen it in dozens of other cases around the planet. The “warmth” is from clipping of the cold spikes, and it has onset with the Duplicate Number flag change. In this graph, instead of the average dT/year we see the individual months dT for that year. So there are 12 lines in this “Spaghetti graph” for dT(per month)/yr. Maybe we ought to call it a ‘hair graph’ ;-) and that makes it look useless at this compressed scale. But click on it and enlarge it. Now the monthly extremes are much more visible. The “spikes” of monthly temperature changes are “spikier”. The “clipping” is fairly clearly seen. The start of the newer Duplicate Number flags dampens the really deep downward spikes (as they average with the older Duplicate Number flags) but in 1990 when the old Duplicate Number flags are dropped and only the new carry forward, the “cold spikes” look to me to be lifted to where what in the past was a -6 is now the few -4 about 2001 and the prior -4 spikes are now running about -2.5 C.
There is what looks like a little muting of the “top spikes” but not nearly so much. So, Are The Trends of the Two Segments Different? Is there a simpler place? Somewhere with fewer thermometers and a clearer point in time when things ‘cut over’? Yes, several. This is just one of a half dozen I found in looking at about a dozen randomly chosen places. The scale here is much shallower than for Turkey, since these are Islands in a warm ocean. But even here we can see a “muting’ of the down spikes of dT/yr such that they don’t reach the -0.5 C line and rarely get through the -0.25 C line after the change of Duplicate Number flags. If we look at the two segments, before and after the 1990 era Duplicate Number flag change, do we find a difference? Oh yeah. Again we do see the top peaks slightly muted, but the bottom going peaks are much more muted and the effect of that “peak clipping” of the dT/yr, and muting the depth and quantity of the bottoms; is a dramatic change in the dT line. 1) It’s a Giant “Dig Here”. 2) It is not CO2. 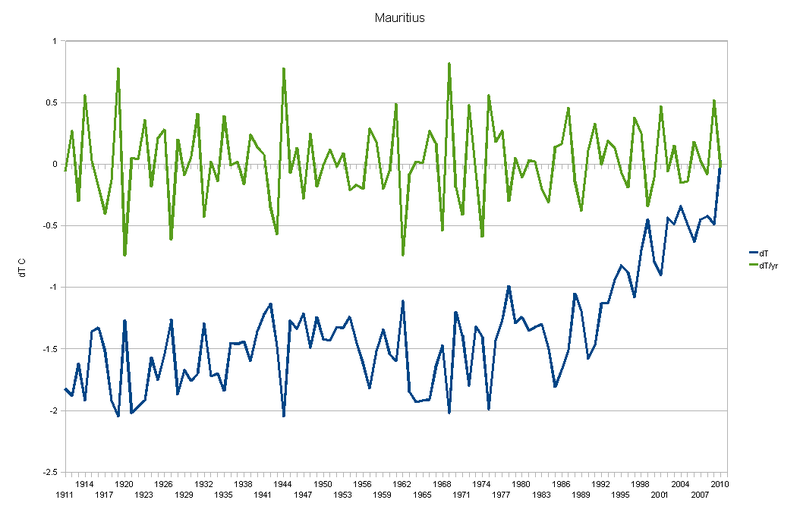 3) It is directly correlated with the bulk of the change of trend to warming in Mauritius. 4) That warming comes, as have most of the cases I’ve seen, as a Step Function or knee, though there can be some ‘blending’ if different records overlap. 5) Dropping thermometers matters (directly, or as here, indirectly via unmasking Duplicate Number flag 3). 6) The specifics of the Instruments, Modifications, and the Siting Matters. A Lot. 7) It’s not the “kept” vs “tossed” that matters it’s the “kept” vs “replacement” at the mod flag level. OK, I can’t make a new posting full of graphs without having at least some tables… don’t want to have withdrawal shock ;-) so here are some small tables showing some of the “Duplicate Number flag” changes in Mauritius. These are mostly for documentation of what to look for in the data for folks who want to look at the data themselves; those not interested in the input data will want to skip this part. The first 3 digits are the Country Code “129” for Mauritius. Then 5 + 3 for station and sub-station ID “61986” + “000”. Then the Duplicate Number flag. “0” for this first thermometer record at that place. Then the year (1986 in this first line). Then 12 monthly temps in 1/10 C so that first one “273” is really 27.3 C.
We see it ends in 1991 with the last 6 months having 3 missing data flags of -9999. Same Station ID, but we get a “1” Duplicate Number flag (that actually starts in 1954). Then we get to the “Duplicate Number flag 3” that carries forward as the other die. It starts in 1987 for a bit of blending and “feathering” in with the other records, then, as they die off in 1990+, it is what gives us the temperatures today. This entry was posted in AGW Science and Background, dT/dt, Favorites and tagged GHCN, Global Warming. Bookmark the permalink. BTW, probably there was a XC rendition of Hot Hot Hot among that 16Gb. FWIW, I’m planning to go country by country and sort them into “Not Warming – You get a Carbon Free Pass” and “Cooling – Should we pay you?” and “Warming with The Smith Effect – BOHICA” and if any: “Warming but don’t know why”. Wow, my plum tree thought it was spring already, but my car windshield had a different message this morning; 1/8 inch of ice. Not the white frosting kind, more like the thin glass mostly-transparent kind. Luckily the hose is also full of very cold water so I was able to effect local microclimate change without the deleterious effects of excessive dT/dt on the underlying transparent surface. Your use of that mochine may be the most valuable thing it ever did. Well, maybe the second most valuable. The Global Gridded population dataset for Turkey seems to suffer from the same problems as Iraq Syria and Saudi Arabia. I.E. Population records are kept by administrative districts similar to a US County. This results in population densities being homogenized across the entire county. Which end up distorting population densities. If I check the population of Ankara,Turkey it’s 3,700,000. The population is something like 400,000. The population density is homogenized at we would call ‘county’ level which results in a gross understatement as to the level of urbanization if I depend on the ‘Gridded Population Density’ to determine urbanization. If I use King County Washington as an example. If I use the population records kept at the county level I get 2 million people in 2,000 sq miles of land. Giving a population density of roughly 1,000/sq mile. the city of Seattle has 600,000 people crammed into 84 square miles. A population density of 7,000/sq mile. In the city of course. “Same Station ID, but we get a “1″ mod flag (that actually starts in 1954).” – shouldn’t that be 1984? EM, why do your dT curves for Turkey start at -3C? Very good work – Excellent post. I’m surprised someone from NCDC or GISS hasn’t posted a reply here saying: ” You dumb ****, all you had to do was go to “www…”, and check the meta data. As you can see, the A/C was added in 1990, so the computer model adjusted the data”. Very interesting post and analysis. I too have been looking at Turkey due to the very many stations for the size of the country. I might do a post on this myself incorporating some of what you have found. !992 seems to have been very cold in Turkey: http://www3.interscience.wiley.com/journal/114078036/abstract. Perhaps if you can look at the 1990-1995 period more closely this would show up. Looking at many of the individual station records 1994 seems to have been very warm. Some stations have a 3 degC jump between these years. Great graphs BTW, but small nitpick – the dates on your X axes are very hard to decipher. BTW, I haven’t found a way (yet) to customize that axis labels as I’d like in Open Office. However, the graphs are ‘way big’ if you click on them and then the dates become much more readable. On the small scale here (especially on my 12 inch screen Mac) the dates are just a blur unless I dig out some reading glasses, and even then it’s just barely readable, maybe. So “puff it up” and it’s better. To change the x axis graphs, open the edit feature on the graph by right clicking on it and selecting edit. From there right click on the x-axis and select format axis if you have upgraded to ver 3.2 (I forget what they called it in 3.1 but it’s the top option). Now click on the Label tag and this brings up formatting screen for the layout of the axis. My preferred choices is to select “Tile” or set the degree option to 90°, this spaces the years out better. Tile will leave the numbers horizontal but spaced out, setting to 90° turns them vertical which I like since then you can see which of the div bars it corresponds to easily. Among the geographical regions, only Eastern Anatolia appears to show similar behaviour to the global warming trends, except in the last 5 years. All the coastal regions, however, are characterized by cooling trends in the last two decades. 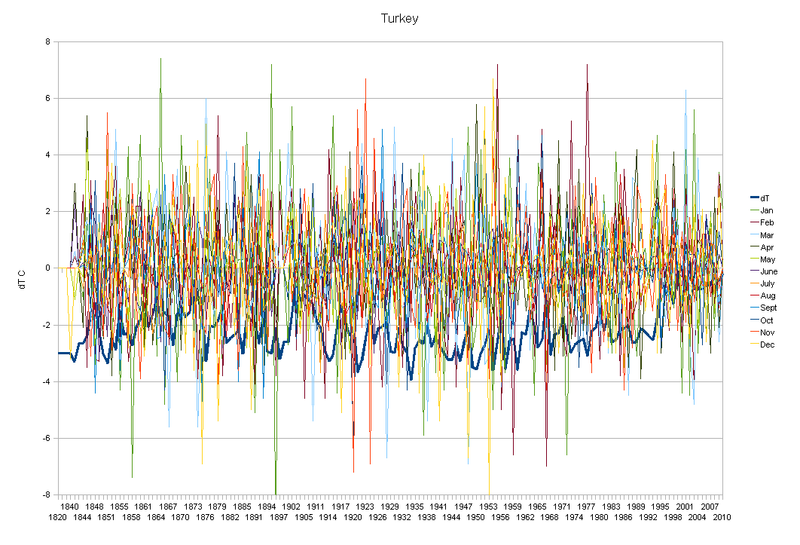 Considering the results of the statistical tests applied to the 71 individual stations data, it could be concluded that annual mean temperatures are generally dominated by a cooling tendency in Turkey. The coldest years of the temperature records of the majority of the stations were 1933 and 1992, respectively. 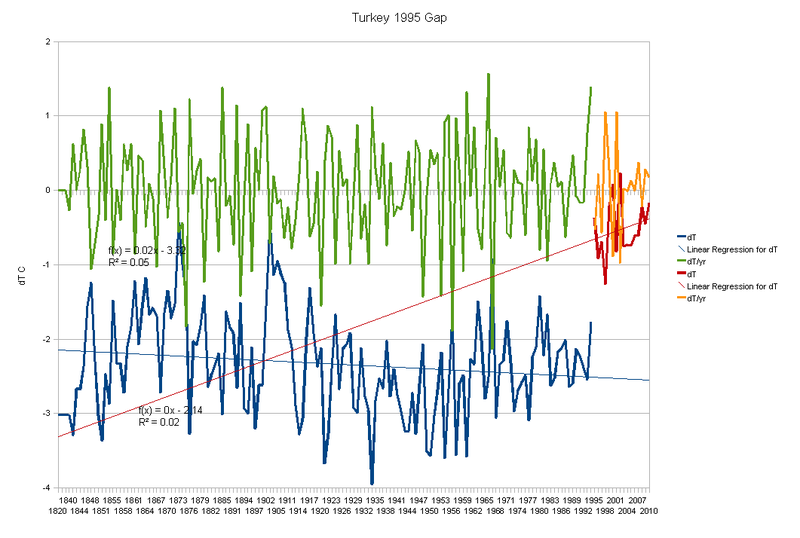 So when they looked at ALL the stations in Turkey, they found a cooling trend (that I would speculate is roughly consistent with the cooling trend I identified in the first part of the data (the blue segment) before the “hockey stick” knee and the Mod Flag change segment (the red segment). The study covers a 63-year period starting from 1930 and uses temperature records from 85 climate stations. First, spatial distributions of the annual mean temperatures and coefficients of variation are studied in order to show normal conditions of the long-term annual mean temperatures. Then variations and trends observed in the annual mean temperatures are investigated using temperature data from 71 climate stations and regional mean series. Various non-parametric tests are used to detect abrupt changes and trends in the long-term mean temperatures of both geographical regions within Turkey and individual stations. In what sure looks to me like a fairly rigorous and in depth manner. And they find it’s cooling and not making a Hockey Stick warmer…. Here’s a thought I haven’t analyzed very much. Does the ‘Hair’ graph of a combined data set give a visual indication that non-homogeneous data sets are being combined? It looks to me like 2 thermometers are being averaged where one has ‘higher lows’ than the other one. The result is a dampening of the down excursions… Then you take away the cooler older thermometer and “voila” it’s warmer… But I’ve not had the time to work through the details to test the theory. 2) Dead Flat of Falling trend, but truncates between 1980 and 1990 or so. These will then be filed in from somewhere else. 3) Some are flat or falling and persist to today. 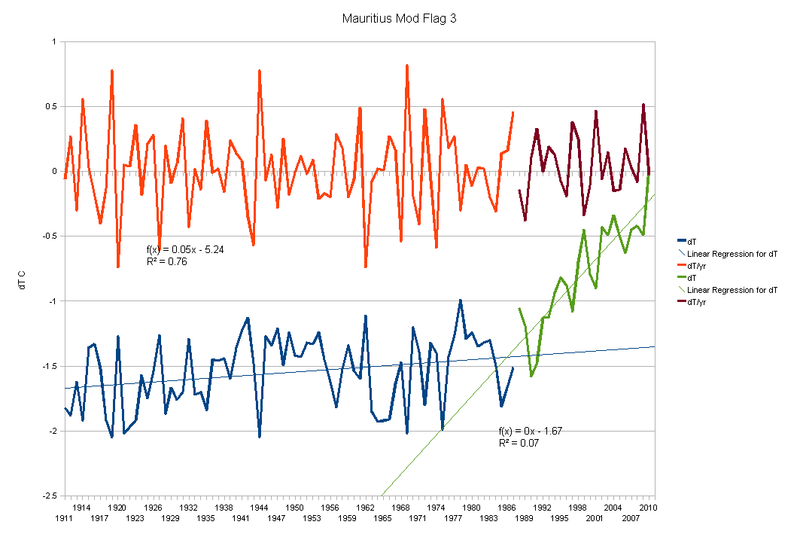 4) Many have a “hockey stick” (often with onset about 1990 with a Mod Flag change, some in 1980, some about 2006-7, some with both a 1990 and a 2006 ) that is characterized by a substantially FLAT or slightly rising lead in, then a STEP FUNCTION to warming trend on the Mod Flag change. Sometimes with a bit of ‘blending’ or ‘feathering’ as the stations overlap from about 1987 to 1992. These will be used to do most of the inflilling as other stations exit. And not much else at all. Not a hint of a peep of the pattern CO2 would make with steady rising or “rising steady with an imposed ‘rolling’ such as from the PDO flip”. What we have here is a Mod Flag and instrument change driven step function, by country, being masked with all the in-fill, homogenizing, UHI “adjusteing” etc. Very interesting. 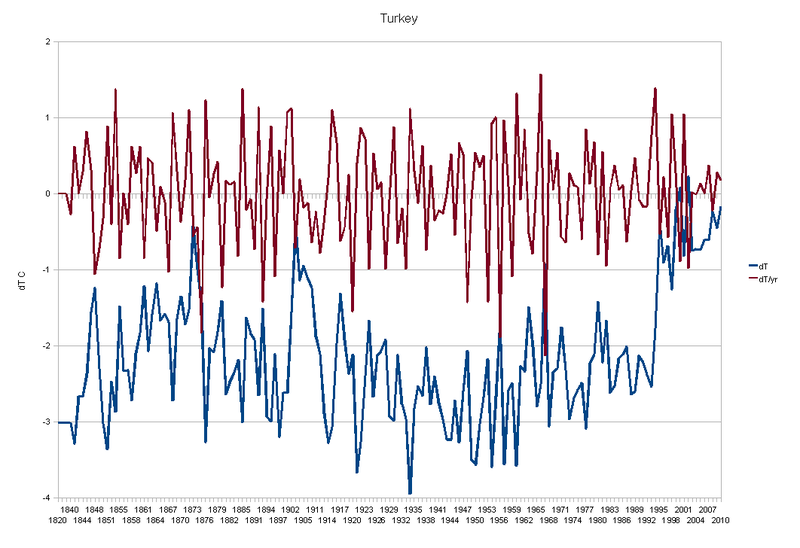 In fact the whole ‘thermometer’ thing in Turkey is a bit of a travesty as far as really following the climate.